Menu labeling for your restaurant or small food business doesn’t have to be difficult. 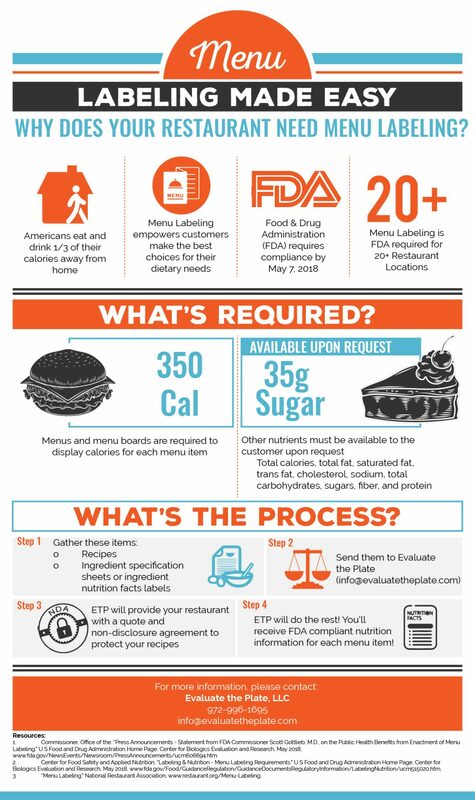 Check out the infographic to explain everything you need to submit a recipe to for nutrition analysis! Menu labeling is a disclosure of calories and other nutrients to customers. It is Food & Drug Administration (FDA) required for restaurants, convenience stores, deli’s, and vending machines with over 20 locations. Because Americans drink approximately one third of their calories away from home, menu labeling empowers customers to make the best choices for their dietary needs. Restaurants are required to display calories on their menus boards and must have a list of additional nutrients available to customers upon request. These nutrients include total calories, total fat, saturated fat, trans fat, cholesterol, sodium, total carbohydrates, sugars, fiber and protein. If you have any questions about the process, please send us an email! We’re happy to help.